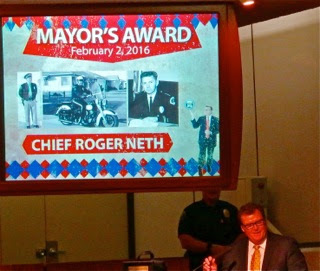 The Costa Mesa City Council meeting Tuesday night started out on a very happy note with the presentation of the Mayor's Award to former Costa Mesa Police Chief Roger Neth - a man who served this city proudly - as one of the first three officers hired and the second Police Chief- for more than three decades. 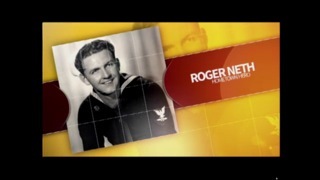 Costa Mesa Television prepared a very nice tribute video about Neth's career. Mayor Steve Mensinger gave a preamble and a key to the city. 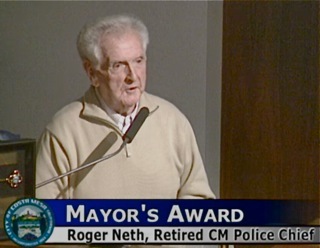 Current Chief Rob Sharpnack also paid tribute to Neth as he spoke about the core values he instilled in the department and the Chief also spoke about a few of the things of which he was most proud. 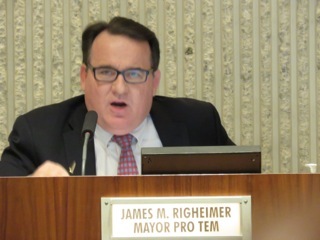 He mentioned that the Costa Mesa Police Department was on the cutting edge in using technology, such as the CAD/RMS system, videoing DUI suspects. 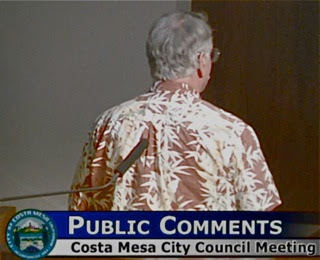 He didn't mention the helicopter program which he began, nor did he mention that Costa Mesa provided contract policing for the brand new city of Irvine, instilling those same values in that department. 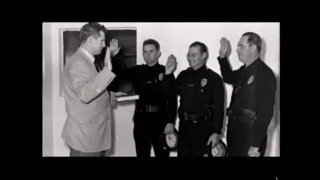 Many of the contract employees became Irvine police officers when that department was formed. That City is acknowledged to be one of the safest in the country. The meeting fell straight off the cliff following the Neth presentation. 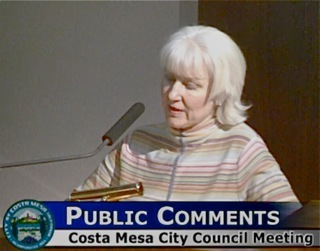 During Public Comments Mary Spadoni criticized the decision made at the last meeting regarding keeping the medical transport situation as-is, and cited chapter and verse from previous meetings where council members agreed to move forward with medical transport - and pointed out the falsehood made previously. 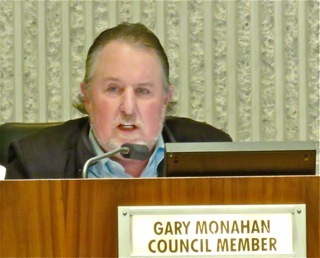 Costa Mesa Firefighters Association President Rob Gagne then stepped up and also expressed his disappointment. 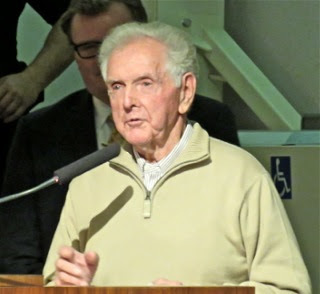 He gave a history of the steps the CMFA took to help the city with their contract and their support of Interim Chief Tom Arnold's 17-point plan. 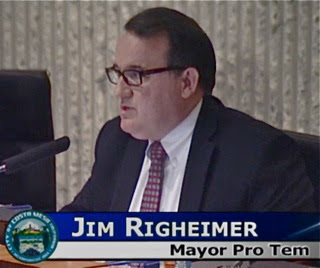 He then directly criticized Mayor Pro Tem Jim Righeimer for statements attributed to him from an Orange County Register article, HERE, in which he made false statements . 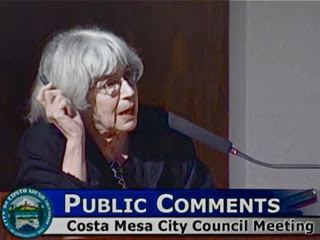 In that article Righeimer accused the CMFA of blocking more efficient options, which Gagne vehemently denied last night. 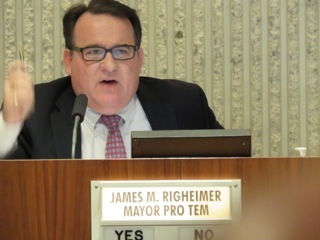 At that point Righeimer flew off the handle and demanded a "point of personal privilege" to respond to Gagne, even though he would have time during his Council member comments segment. As it turned out, he used BOTH opportunities. He ranted and raved, saying he found it "shocking" that the Union President would make those statements. He went on and on. Not only was it embarrassing, but he lied during his rant again. 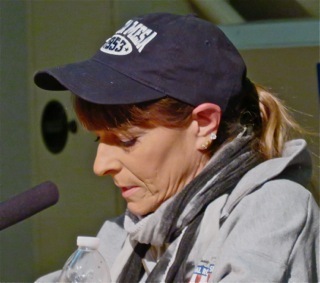 Tamar Goldmann began her three minutes by hoping out loud that there were still firefighters in the house because Righeimer's rant caused her blood pressure to rise. She then cited Chief Neth for his service and the standards he established. 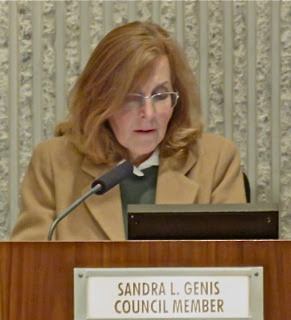 She mentioned a conversation she had with former Chief Tom Gazsi - now the Chief of the Los Angeles Port Police - in which the performance of the members of the department was discussed. She observed that, despite the unpleasant atmosphere created by the council majority, those men and women who had not departed continue to perform at a high level. She said Gazsi attributed that to the culture created by Neth and other chiefs who preceded him. Beth Refakes reminded us of the current candy/easter egg collection for the children of the 1/5 Marines at Camp Pendleton. 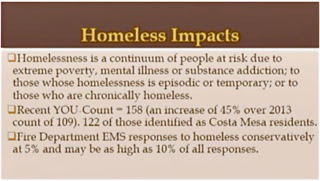 An unidentified person provided a personal anecdote about the difference between Costa Mesa Paramedics and CARE Ambulance drivers, citing the inexperience of the CARE staff. 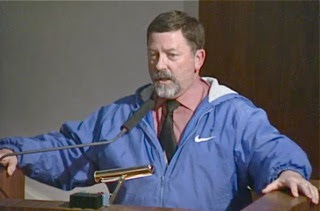 Former councilman Jay Humphrey, who lost a seat on the council to Righeimer by 47 votes in the last election, and a regular speaker before the council was apparently so upset with how the meeting was going to this point that he abandoned the several things he had planned to address and told the council that it was clear that they don't listen. So, he decided to use his three minutes to communicate with them the only way he could - and he promptly turned his back to the council and just stood there. He made his point. 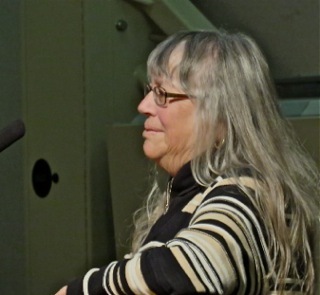 Former councilwoman Wendy Leece, who has stayed involved in city issues since being termed out, also expressed disappointment in the Medical Transport vote. Cindy Brenneman also stepped up to express her disappointment in the council's unwillingness to listen to its staff and the consultants on the Medical Transport issue. 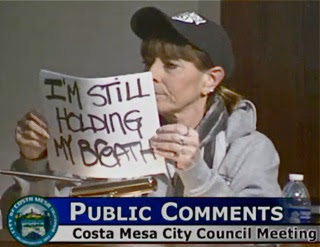 She spiced up her commentary, then simply used the remaining half of her time holding this sign. Robin Leffler joined in on the Medical Ambulance issue. She indicated that friends called her a "Pollyanna" because she continued to hope for a good solution. 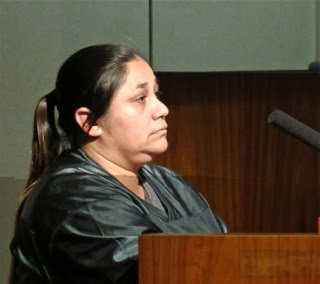 Cindy Black told us "I'm no Pollyanna", then blasted Righeimer, saying, "That is not a pulpit and you're no preacher." 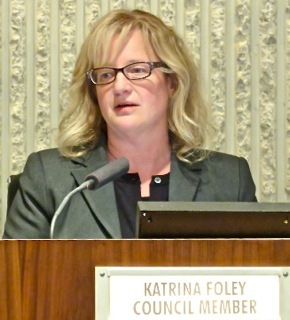 She then spoke of the citizen unrest and cited the Smart Growth Initiative that is in the works and the new Fairview Park Protection Initiative for which signatures are currently being gathered. She also talked about the meeting Saturday at Fairview Developmental Center where input is being solicited from the public. 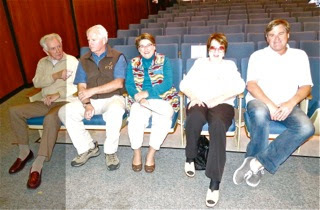 And, she encouraged folks to attend the meeting on February 10 in Morro Bay to reject the plan to oust the current Director of the Coastal Commission by developer groups. 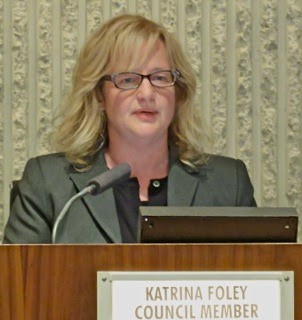 During Council Member Comments Katrina Foley mentioned the "CHAD" (?) conference in November. 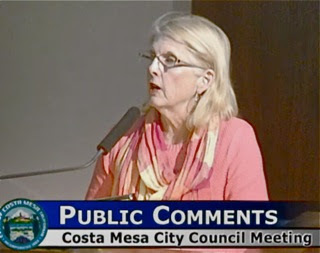 Sandra Genis thanked the Costa Mesa Police Department for the professional way it handled the recent incident in her neighborhood where a man ran from an accident, fired a shot at police, but was later captured. Among other things, she mentioned the recent agenda for the Parks and Recreation Commission that included items dealing with Fairview Park, citing the road that's planned, plus the parking lot lights, neither of which are part of the Master Plan for the park. She also commented on CARE Ambulance response times, then mentioned that no council member may unilaterally decide on a relationship with another agency - that requires a discussion by the council and a vote. Then it was Righeimer's turn. After mentioning the police action near his home, he went off on another anti-union screed about paramedics. He reiterated the lie again that he didn't vote to buy the medical vans to transport patients, despite the fact that speakers had refuted his comments earlier. He told us he was "Tired of this charade." He said it twice. He said he's only got 3 years left, then mumbled something. Can he be that stupid? Gee, I guess so. By the way, while we're back on this subject, some of you may not have seem my commentary in the Daily Pilot Sunday on this issue. You can read it HERE. Then came time for the CEO's report. 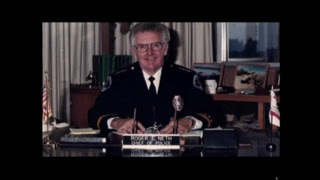 Tom Hatch had three issues. 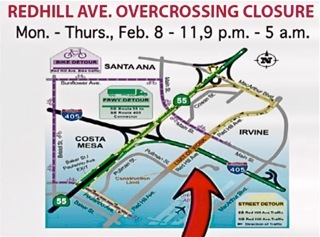 The first was the closure of Redhill from Main Street to Pullman starting soon. 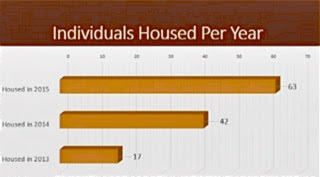 Here's a chart that shows it. 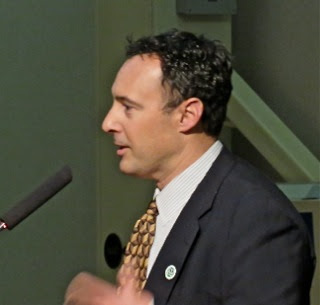 Then he addressed the Fairview Developmental Center issue, speaking that the General Plan would address that site for zoning for re-use should the State actually close it and sell the land. 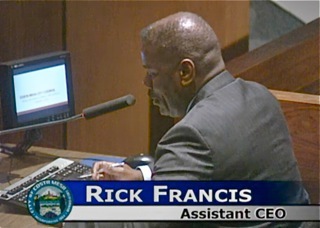 He then turned the segment over to Assistant CEO Rick Francis for an update on the Homelessness issue in the City. 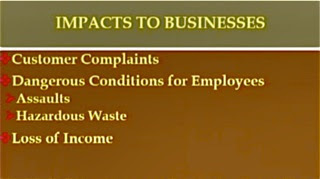 The following series of slides explains what he told us. Click on them if you need to enlarge them. 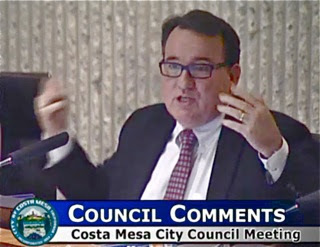 As the council members began to discuss this issue Genis interrupted and asked City Attorney Tom Duarte about the propriety of this practice - having an item presented without being agendized and having a discussion ensure. She was concerned about Brown Act violations - this is not the first time this has happened. 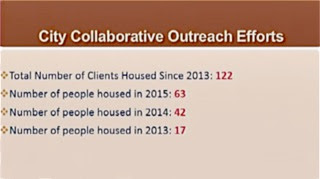 There was NO mention of this presentation on the agenda. Duarte told the council to keep any comments general in nature. 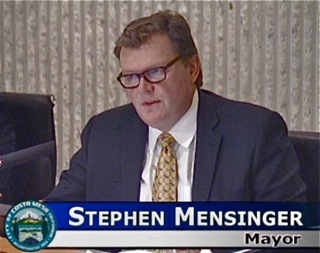 Mensinger blew it off, stating to Genis, "We have our City Attorney's opinion." The arrogance of these guys is just unbelievable! Finally, at 7:35, they got to the Consent Calendar and one item was pulled - the Warrant. It would be discussed later. 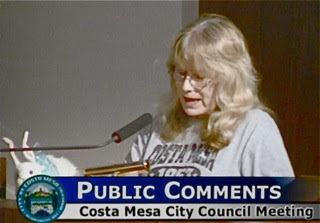 At 7:38 we got down to business on the only item on the agenda, New Business #1 - Katrina Foley's request for $15,000 for the Newport-Mesa Unified School District to BEGIN a feasibility study to provide more bleachers and other enhancements at the new Costa Mesa High School athletic complex. This should have been a quick issue - it wasn't complicated until the council got their hooks into it. This request is simply the starting point - and $15,000 likely wouldn't be the only funds necessary. Earlier they had approved $50,000 for a feasibility study. Round and round they went, trying to resolve issues that were not before them. 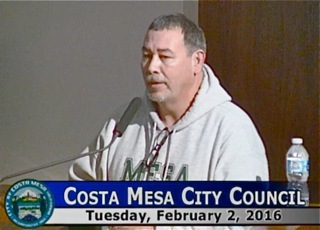 Costa Mesa High School Principal Jacob Haley spoke briefly. 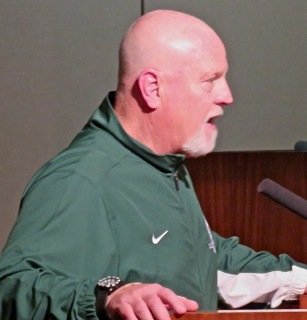 Costa Mesa High School Football Coach Glen Fisher addressed the need and thanked the council for moving this forward. Two "football parents" spoke, also in support of the plan, as did Gay Royer. Foley asked Dr. Kirk Bauermeister to come up from the audience to speak to the issue, providing some insight to the school district's process. He affirmed that they needed the $15,000 and a letter from the City outlining what they were looking for in order to proceed. He also said there was no guarantee that they would proceed. And round and round the conversation went before Monahan moved to follow the staff recommendation, but increase the amount to $25,000. It passed, 5-0 at 8:30. 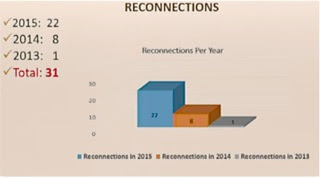 The Consent Calendar items were heard. Al Melone complained about a couple bucks paid for pea gravel at the bark park. An unidentified person wondered why we were doing business with Blackrock Construction, since we fired them for shoddy construction on streets projects in the city and resident, and former council candidate Lee Ramos was injured and sued the company. We were out of there at 8:40 - an hour later than we would have been except for Righeimer's rants. I think I have a solution... the way he waves his arms around when he gets wound up, perhaps we should just have the Sergeant-at-arms handcuff him to his chair - or just slap some duct tape on his mouth. Why does Riggy lie all the time? Why does Riggy hate public safety? Why does Riggy love people in Denmark more than the people in Costa Mesa? Jim rants twice and lies numerous times, Steve blows off the Brown Act and citizens are ignored and insulted. Nothing new here. 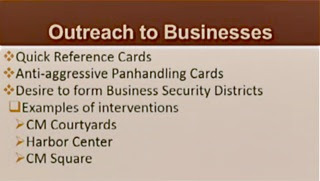 The public / private partnership model combines the best of what each sector has to offer. Your paramedics are provided by your fire department and respond when the 911 system is activated. They provide the ALS or paramedic first response component and have a targeted goal to arrive on scene within 5 to 8 minutes. Care Ambulance is dispatched simultaneously and depending on the contracted response time requirement, arrive within 8 to 14 minutes. This model is highly efficient in that if you need the paramedic to accompany you to the hospital, he or she will get in the ambulance and accompany you to the hospital. If your condition is less serious, the paramedic will release you into the care of the Care Ambulance EMT's or Emergency Medical Technicians. This allows the paramedics to return to service and remain available for the next emergency. CARE Ambulance is also a backup 911 ambulance service provider for several other communities throughout Orange and Los Angeles Counties. CARE can NOT respond as quickly as the fire department and relies on FD to get there first and assess the patient. CARE is manned by EMT's with 100 hours of training. They are paid around $12 an hour, and CARE bills a ride to the hospital at over $900 + mileage and supplies (add another $100). See where there is money to be made? Jim's problem is that he would rather see a private ambulance company rake in money, even though it is dependent upon the paramedics from the FD to provide service, than see a public employee make a salary he thinks only he deserves. Where did he get that $145,000 salary number anyways? The President of the Fire Association really got to Riggy and it showed, he had to fire back right then and there with his standard comeback lines and lies, because he wouldn't have been able to keep his train of thought if he had to wait for Council comments. watching the CC meeting last night. Casual Viewer: I don't believe for one minute that the millions that CARE is raking in from this deal don't come back to Righeimer in some form We know he gets huge campaign donations from CARE. I suspect the owner, one of his friends, makes sure his buddy is well taken care of. The only answer to me is to increase the City Council to seven members, and have a Police Commission, and a Personnel Commission, all with some teeth. It seems that Steve and Jim tag team on making outrageous statements depending on who is up for re-election. When campaign season started for Jim, he let Steve be the duo's mouthpiece. Now the roles are reversed. Hissy? Tizzy? Rant? All of the above! MPT was shocked, I was HORRIFIED and embarrassed for our city. He was called out for many untruths and just kept denying, evidently newspaper articles, tapes of previous meetings, couldn't shake his memory. He again said he could be home with hus children and family, I agree, do a great favor to your family and our city and take off the next three years. Your antics and diarrhea of the mouth are so inappropriate and won't help your chances of political upgrading, in the future. November, 2016, you may be a little lonely on the dais....for every action, there is a reaction...that's a fact Jack! 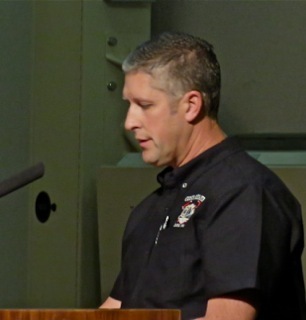 Along with the false statements the Firefighter pointed out Jim Righemer also continues to make SEVERAL false statements regarding the General City Employees 2008 contract bump. I know it's late but I'm starting to not believe anything he says at this point with all the false claims regarding almost everything. Tuesday night he once again repeated the lies. He says city employees only paid 1% of their salaries toward their Pers bump. 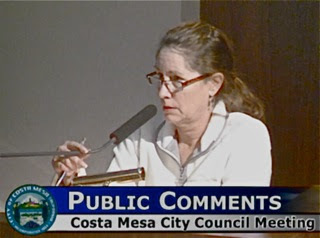 If you check the City of Costa Mesa official link below you will see on slide 14 of that presentation put together by the Pension Oversight Committee that is a total lie. City employees paid 3.52% of their salaries toward that bump. They continue to pay that 3.52% today. 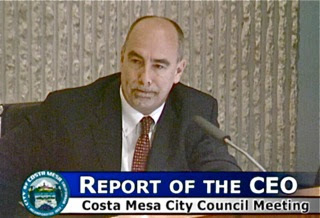 You can also request the May 2008 City Council meeting reports and see it is a lie what he says. He also further makes false claims with the swipe of that pen that night it immediately cost the residents $16 or $18 million dollars. Another total bald face lie. In the staff report the actuarial costs of that bump was clearly listed as $4,000,000. The general city employees part of the unfounded went from $16,000,000 to $20,000,000. But if you think that's the end of the false claims it's not. Remember last meeting he claimed it was done in the late night while residents were unaware. 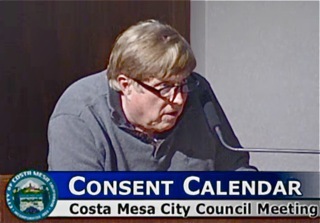 The mayor and he have claimed previously it was also done as a consent calendar item done late night while residents were asleep, approved on a Friday and then voted the next Tuesday where it slid in without residents knowing and over and over. The truth is the opposite. It was not done at late night hours. It was during a meeting that only lasted about 2.5 hours. Their meetings started at 6pm back them so you do the math. It was also done at a regular council meeting in May of 2008 and then had readings at 2 subsequent meetings to become official. So the claims it was late night, rushed through, was a consent calendar item while residents were asleep are all lies too. There's so much more. But the fact is they are lying about this and it's all so easy to check. The Pension Oversight Committee has the truth, the City has it available, the meetings histories are available online in videos. Sadly most people never know they are just lying. Short Council Agenda Tuesday - Why Bother?